Rope climbing is a great family outdoor activity. There are several rope climbing courses located close to Wears Valley. You might also want to plan a whitewater rafting trip at the same location on the same day. 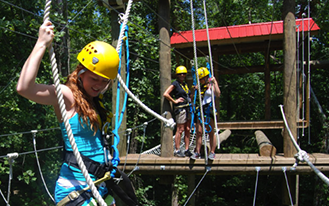 Ropes course features 12 different activities across 4 different skill levels, including balance beams, climbing nets, and rope bridges. Directions: From Asheville/Maggie Valley, NC: Take I-40 W to second exit in Tennessee, Exit #447 (Hartford Road). Exit and turn left. After going under the bridge you will find the river outpost on the corner by the BP Station and the Bean Trees Cafe. Rafting in the Smokies/Family Adventure is a log building with a red tin roof. WonderWorks takes family fun to new heights with the World’s Largest Indoor Ropes Course. Standing 50 feet tall, visitors will climb 4 stories of ropes as they encounter over 50 different obstacles and activities; including swinging steps, lily pads, a tremor bridge and more. Great activity for kids and adults. Adventure to the top of a 25-foot wall choosing your own route. This climbing wall is located indoors allowing you to experience the realistic rock feel of a climbing wall and a feeling of accomplishment upon reaching new heights.